If there’s recipes I’m looking for this time of the year, they’re ones that make good presents. I have a yearly tradition with my friend, Michelle. For the last, oh, ten or so years, we get together for an entire Saturday or Sunday, and bake Christmas cookies. These cookies then become the basis of much of my holiday giving. I divide them up into colorful Christmas-themed cellophane bags, attach some curly ribbon, and hand them out to Michael’s teachers, my friends, neighbors, or anyone that invites me over to their house. I figure, in this day of pre-packaged everything and no time, that likely, most folks don’t have the time or the resources to bake scratch cookies. So I think it makes a good gift. Every year, I always try out some other things as well, usually related to candy: toffee, sponge toffee or peanut brittle (which usually goes to my dad). I remember making caramel corn as a child in Newfoundland, but I haven’t in a really long time. I didn’t remember it being that hard, and sure enough, it’s not a very complicated recipe. It does take a little love, though, hence the reason it makes a good gift. Pop the popcorn and put it in the largest bowl you have available. Preheat your oven to 325 degrees, and butter two large cookie sheets. In a medium, heavy saucepan, melt the butter over low-medium heat. Add the sugar and the corn syrup, and stir it until the sugars melt into the butter. Turn up the heat a little, you’re making a caramel, so you want it to be bubbly for about two minutes. Remove from the heat and add in the vanilla, salt, and finally the baking soda. The baking soda will react with the caramel, and bubble up quite violently, so be careful! 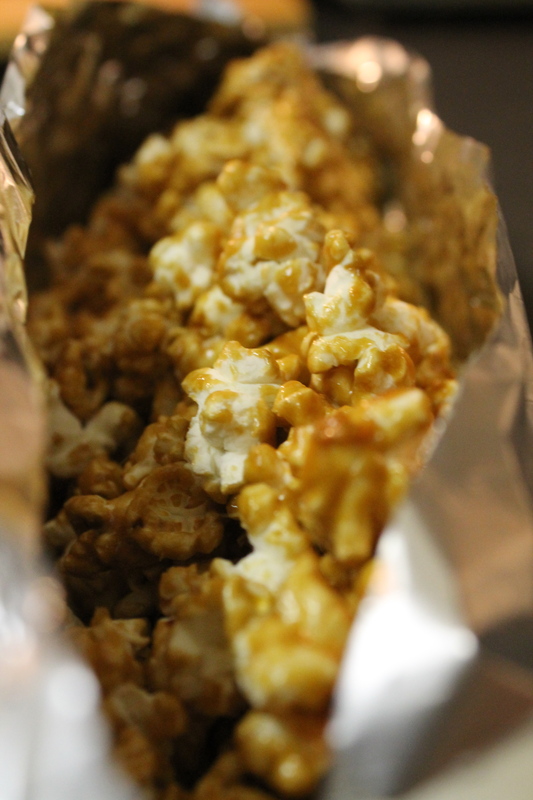 Working quickly, pour the caramel over the popcorn, and stir it all in, coating as much popcorn as you can. The caramel will harden quickly, so you might not get everything coated, but that’s okay. Divide the popcorn in half, and put half on each cookie sheet, spreading it out in a single layer. Put it in the oven. Set a timer, and every 5 minutes for 20 minutes, turn and stir the popcorn. 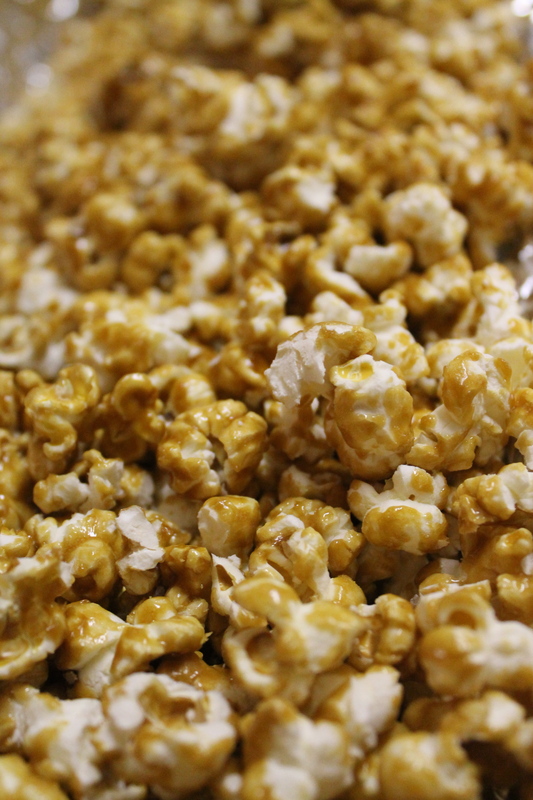 The heat from the oven will keep the caramel soft and pliable, so you’ll be able to coat the popcorn more and more each time. While your popcorn is baking, take a large piece of aluminum foil and spread it out on your countertop. After the 20 minutes are up, take the popcorn out and pour it directly into the middle of the tin foil. Sprinkle with sea salt. Wrap it all up so that as much as possible, the popcorn is contained inside the foil. Leave it to cool. When cool, bash it up to break up the chunks. Store in an airtight container, or put into pretty bags to gift. What am I saying?? Good luck with that. It’s delicious. It’ll never make it out of your house alive! For a slightly healthier alternative, check out From French Fries to Flax Seed’s All Natural Popcorn Balls. Well, kids, it’s that time of year. One of my long-standing holiday traditions is that I choose a day in late November or early December, and get together with my friend, Michelle, for a full day of cookie-making. We use the cookies as hostess gifts when we get invited to parties, we give them to our kid’s teachers, and I also give them to clients and media, or anyone that’s helped out my business during the year. When I was just starting my business a few years back, and was super broke, this felt like a thoughtful gift. I mean, who has time to bake cookies anymore?? The tradition stuck, and now it’s expected. Over the next couple of weeks, I’ll share some of our traditional recipes with you, but this year, Michelle tried out a new one, and I am in LOVE! This recipe comes from Alicia Silverstone’s Kind Diet Cookbook, and is meant to be vegan. 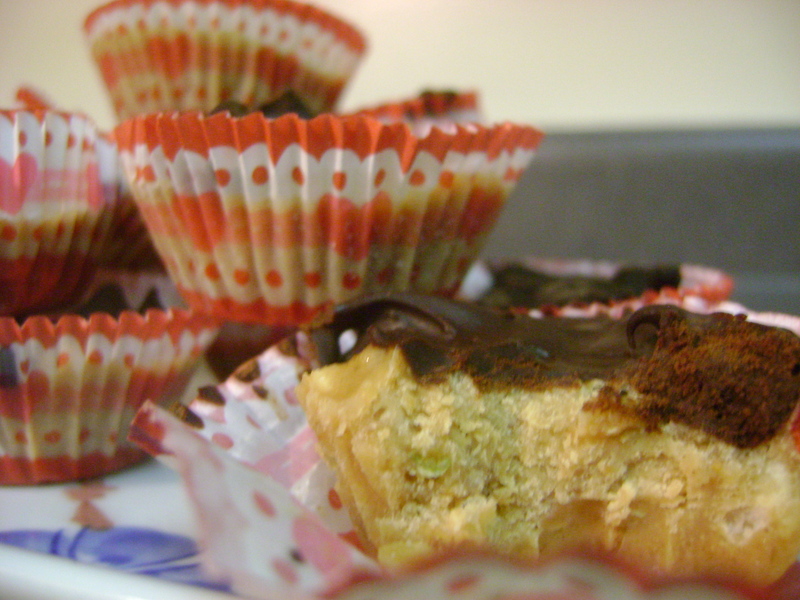 Her recipe also calls for regular muffin cups, but I find these are so rich, that two little bites is enough to make me happy, so I made them in petite-four cups that I had lying around from making miniature brownies.